When I started getting really sick my people heard a lot about this whole “Rainbow Bridge” thing. To be honest, they didn’t care much for the concept. Then, they helped me get there. And I must say, this place rocks. So what is the Rainbow Bridge? In short, it is a poem about doggy heaven. Commercially, it is the title of many books about pet loss. In spiritual terms, it is a metaphorical place known by people whose beloved pets have died. So, this clarifies something we hear a lot in the Tripawd discussion forums. When dogs pass on, they do not “cross” the bridge. When people lay their dogs to rest, they are helping them go “to” the bridge – where they will meet them once again someday. Glad we could straighten that out. And for the record, the original author of The Rainbow Bridge is unknown. While it is said to have been penned by Oregon grief counselor Paul Dahm in 1981, the poem has been circulated and attributed so widely that no one knows for sure. We don’t care. Ever since my people received a copy along with my remains from the wonderful pet cemetery folks, they think it’s pretty cool and wanted to share it with everyone here. 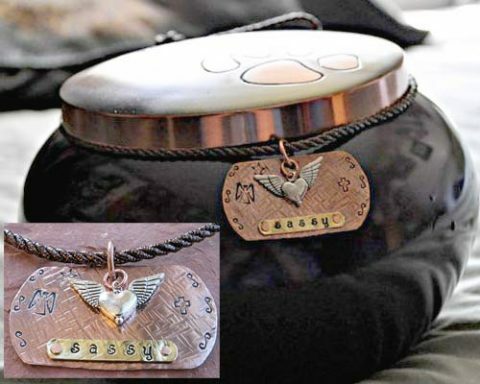 Read Our Review of Heartsmith Pet Memorial Lockets. See Our Selection of Pet Urns, Charms and Memorial Photo Boxes. FYI: For those who have lost their beloved three legged friends, we recently launched the Tripawds Gifts blog Remembrance page with a wide selection of beautiful pet urns and memorial boxes for truly honorable lasting tributes. We lost our angel dog, Kali, and 8 year old golden retriever 4 days ago to cancer. She loved everyone and understood everything, every word, every action. She became a therapy dog with no formal training and brought smiles to faces who couldn’t smile anymore. People with Huntingtons disease, dymentia, people in comas. I am so lost without her and so are the many people that loved her at work. I have not been able to pick up her bowls, bed, toys or food. I try hard not to think of her smiling face because I am not ready to think of her as a memory yet. I took hundreds of pictures of her and they are all over the specialty care facility that I work at and in most of the residents rooms smiling along with the declining residents. God just took her too soon…………. We are so sorry to here about your loss. They are all taken too soon indeed. I’m sure you may find more support than we alone can provide here by sharing your feelings with the entire Tripawds community in our Coping With Loss discussion forum. O Mom, I love you. I miss our girl too. She brought us together, by our walks; watching her “fishing”; swimming with her; answering “what to you say?”, and “Be cute.” I hope to see her at the rainbow bridge with her booboo’s and snorting. Sweet memories indeed. Thanks for the comment. I lost my dog Lady to Cancer a week and a half ago. I am lost without her. Reading the Rainbow Bridge really makes me believe that we will one day be together again, otherwise why would GOD have put them here to love us, and us them. God bless to all who have lost their loved companion, and love to all our precious babies. Thanks for commenting. We are sorry to hear about Lady, but glad you found some peace in the Rainbow Bridge poem. I first heard of this poem almost 11 years ago when my pug Chelbeni died. I still miss her to this day. I’m grateful someosne passed this poem on to me. I have passed it on many times. That’s why I’m here, to print and pass this to someone suffering the loss their dog of 14 years. Thanks for the comment Cindy! We’re glad this post will help you help your friend. They might also find our Coping With Loss discussion forum helpful. 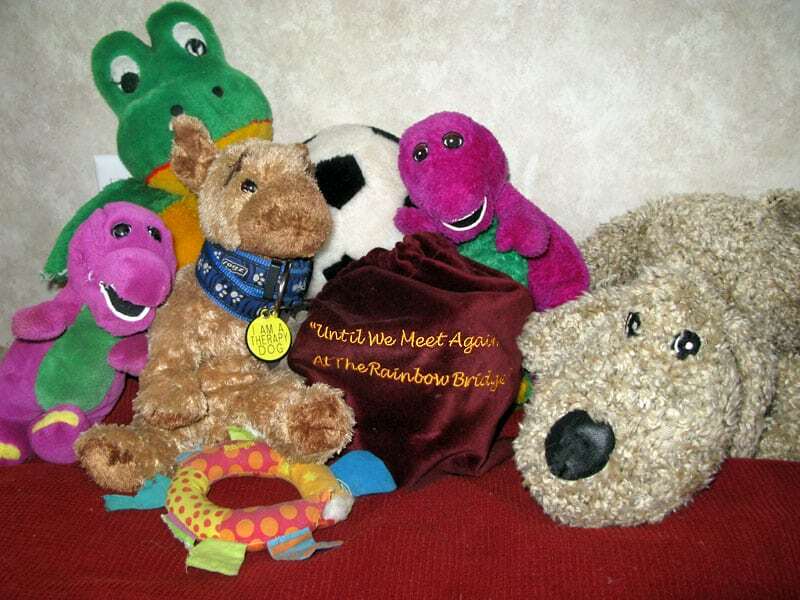 I had never heard of the “Rainbow Bridge” until I lost my little wire-haired dachshund and a neighbor saw how much I was grieving. That evening my neighbor slipped a copy of the poem through my mail slot and I appreciated it so very much, even though I wasn’t quite sure I accepted it. The point is, it is so soothing to me and to think that another person loved their dog, cat or animal so much to write that poem showed me that I was not alone in my grieving. That’s how the “Rainbow Bridge” poem has helped me in many cases. Sandra, can you tell me where to get the remembrance bracelet? I lost my Chihuahua Pebbles in May she was 18 years old. I got her when she was only 4 weeks old, It has really been hard not having her here. I too had to put her to sleep because of Kidney failure. I found Rainbow Bridge Poem one day on the internet and it has helped a lot to think that she is waiting for me. Please let me know about the bracelet.